Part of what makes our most cherished memories of cricket so special, be it a magisterial innings or an unplayable spell of bowling, is the recollection of where the action took place. Those blazing centuries Barry Richards used to score before lunch; Dennis Compton breaking Jack Hobb's record in 1947 with his 17th hundred of the season; that session by Frank Tyson that was the fastest anyone in the ground had ever witnessed - such moments were special not just because we witnessed them but because of where we witnessed them. 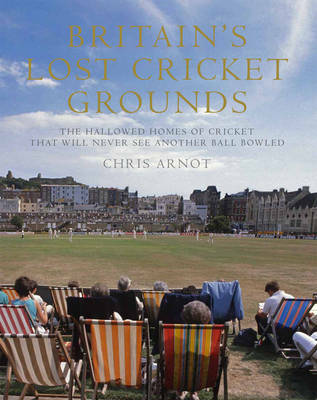 In this beautiful book, Chris Arnot goes in search of the most beloved lost cricket grounds up and down Britain. From the county ground at Southampton and the former test match ground at Bramall Lane in Sheffield to the many works grounds that have fallen into disuse in recent decades, the halcyon days of every one are evoked in the reminiscences of players and spectators; as are the sad histories of decline, dereliction and, all too frequently, re-development that followed. Whether it was the old school ground that witnessed a young Wally Hammond test its boundaries, the country house ground that was graced by Ranjitsihji, or a tiny village ground not much more than a bucolic farmer's field, Britain's Lost Cricket Grounds takes the reader on a nostalgic tour of the places great and small that will never host cricket's greats again.